As the 2015 growing season comes to a close, farmers across the country are turning their eyes toward winter. Dominating the weather headlines is what most call the strongest El Niño since the winter of 1997-1998. And while forecasters are cautious about predicting exact totals, the general trends of an El Niño winter are fairly consistent. We can see from the historical observations in the charts below that the El Niño effect can be fairly predictable. Meteorologists are quick to note that while the El Niño effect has a strong influence over our winter, there are other patterns that will result in various events. 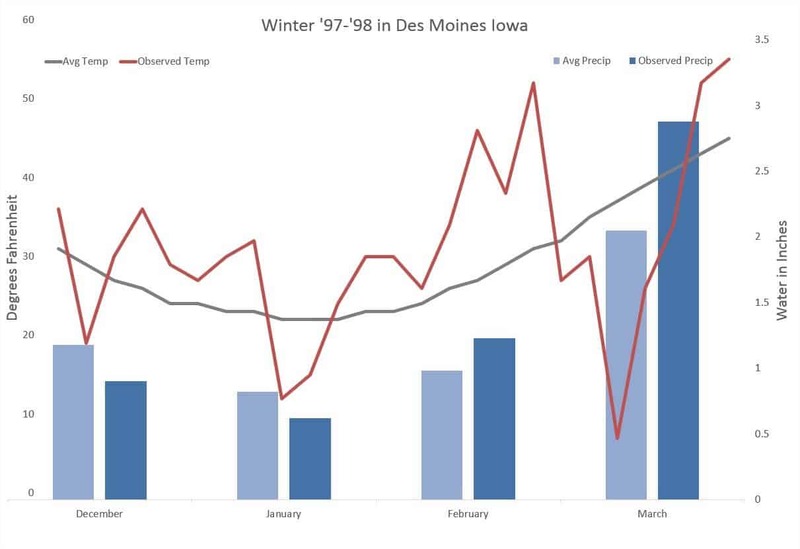 For example, we can see on all our tables there was a strong cooling trend in early March, which is a result of the El Niño weakening, and an arctic system falling into place. The late-season trend will have a strong impact on planting dates and residual snow cover. Winter weather conditions can have numerous effects on farming. Monitoring temperature can show an impact on nitrogen use, soil compaction or even annual weed pressure. Too much or too little moisture early into the winter will also influence field drainage come spring. The R7® Tool can show some of these stresses in the Soil Variability Map, as well as early season in-season imagery. We can also consult the R7® Tool Field Forecasting or Climate FieldView Pro™ to see if any nitrogen deficiencies are caused by extra water before the ground freezes. Review your regional weather data below and then look at your historical data during similar weather conditions to help make better-informed decisions. For example, farmers in the North could consult a Soil Variability Map from a warmer, drier year when determining management zones for their fields. The prediction for the Pacific Northwest calls for much warmer and slightly drier weather than average. This region’s mountainous terrain produces locally specific weather, so it’s not a surprise that the observations in Twin Falls, Idaho were a little off the prediction. December and February of ‘97 and ‘98 were dry, but January was incredibly wet, with over 2 inches of reported rainfall. For the most part, temperatures were above average, with a few cold snaps hitting the area in December and March. 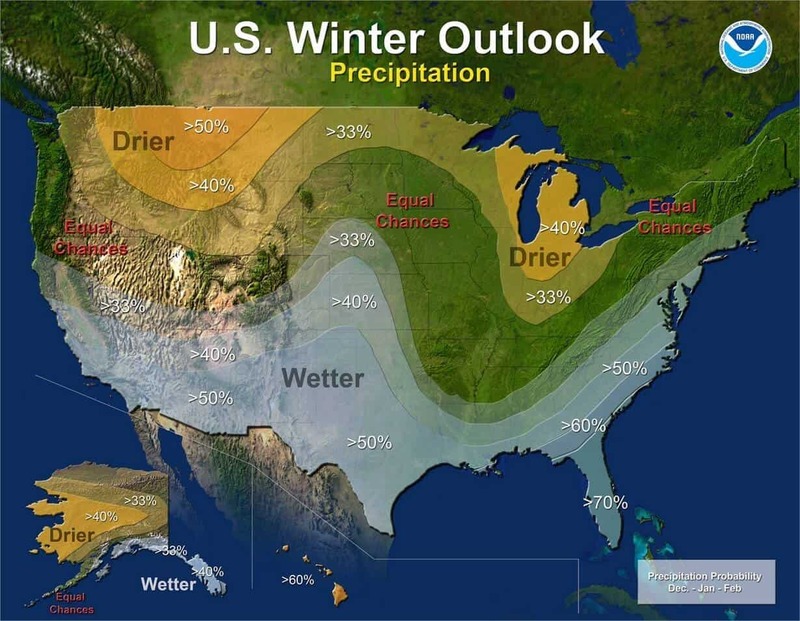 This winter’s prediction calls for warmer and drier conditions across the northern portion of the US. 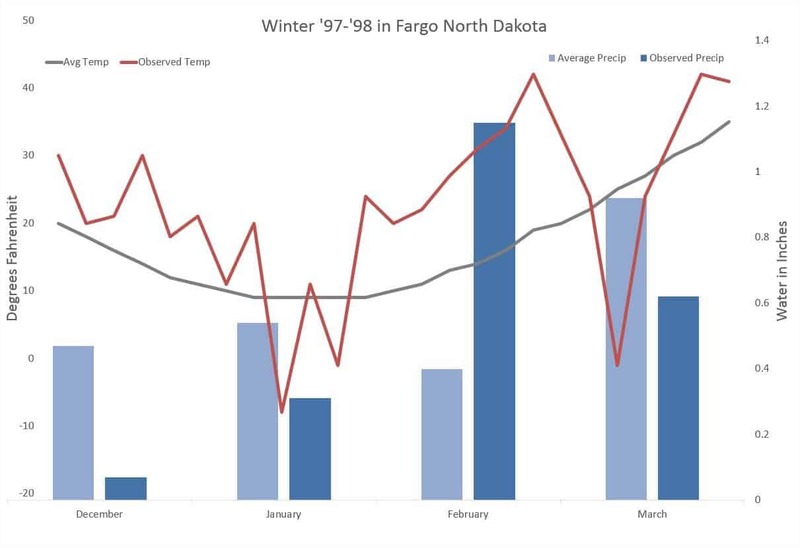 When we look at the data from the ‘97-‘98 winter, we observe that a similar pattern took place in Fargo, North Dakota. Much of the temperatures for the early and mid-winter periods were above average. However, precipitation followed a more average path. Snowfall for the entire winter was fairly minimal, and while February saw a large uptick in precipitation, this was actually the result of some thunderstorms. 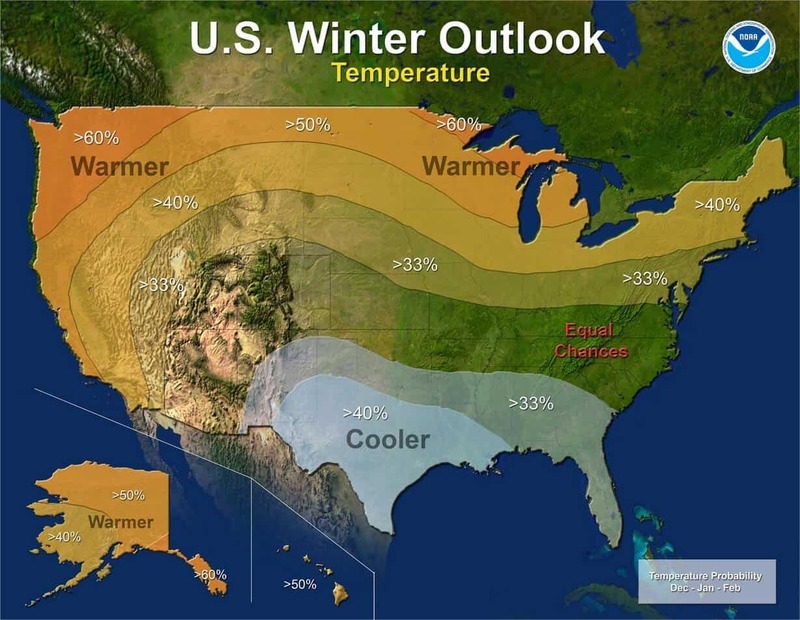 The upcoming winter forecast calls out above-average temperatures and precipitation for the Central Plains region. 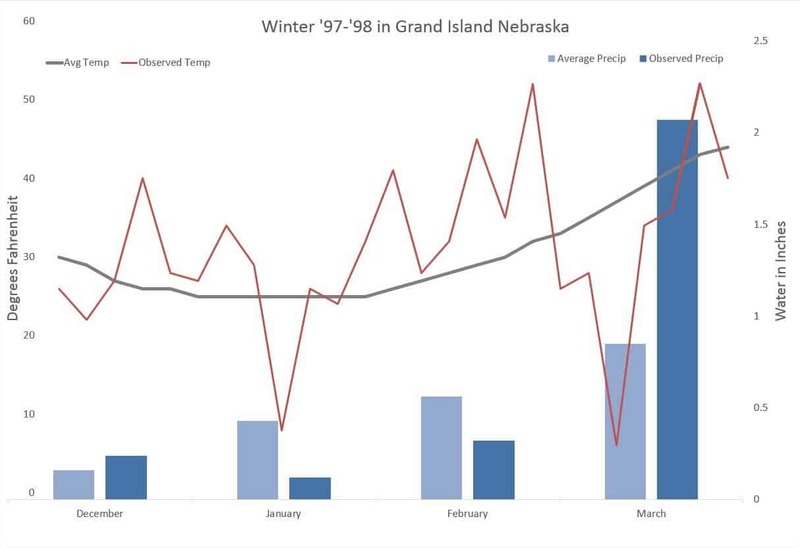 When we check ‘97-‘98 in Grand Island, Nebraska, we actually see some differing observations to this prediction. 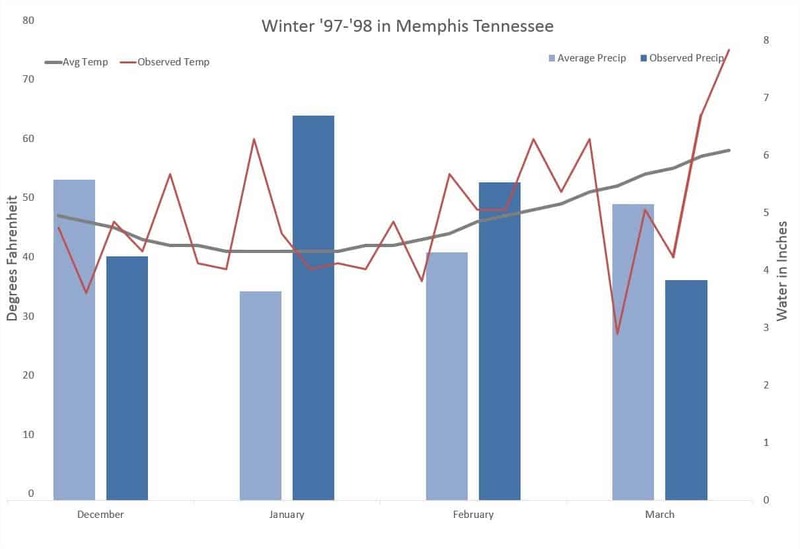 December had a number of days with snow that contributed to an above average-precipitation, but the rest of the winter was slightly drier than normal until some March thunderstorms. Temperatures were fairly consistently above-average, with the exception of some cold snaps in January and early March. This winter’s forecast calls for slightly above-average temperatures and average precipitation for much of the nation’s Midwest. 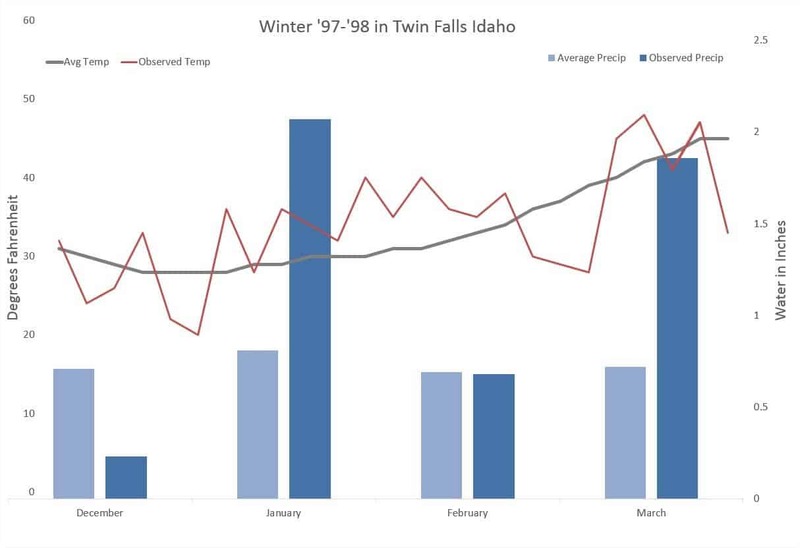 The ‘97-‘98 winter data shows a similar trend. We can see there is moderate warming, averaged out with some cooler events early in the season. We also see that the precipitation was very close to average. There was an increase in March, caused by spring rains starting mid-month. The forecast calls for warmer and drier conditions in Indiana and Ohio as well. 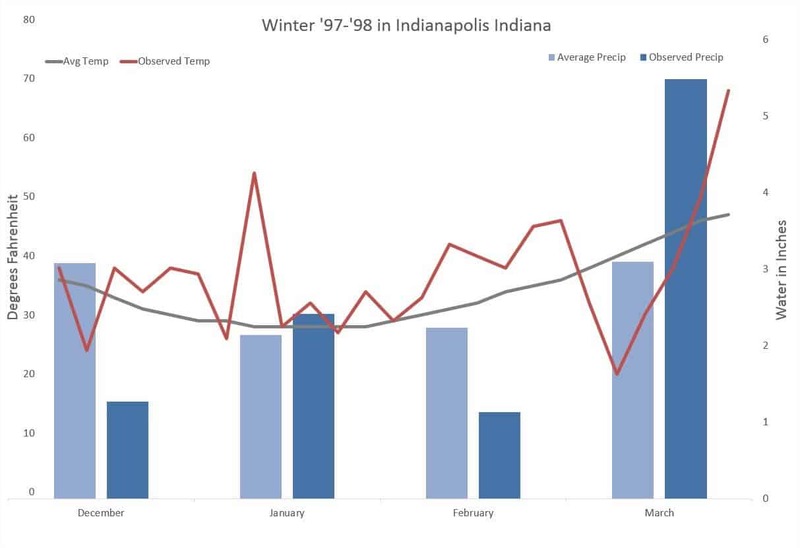 When we look at Indianapolis’ historic weather observations, we see that for the most part, the observed temperatures were fairly consistently above average, with a few cold days mixed in. Precipitation was below average for the most part, though January had a few rainy weeks that brought the total up. Similar to Iowa, March had a number of rain events, which raised the observed precipitation well above average. For the Southeastern region, this winter is calling for cooler and wetter conditions. In ‘97-‘98 we saw similar weather in Memphis. The observed temperature bounced above and below the average temperature, without a dramatically significant trend. The precipitation, on the other hand, was much wetter than average, with excessive rainfall in both January and February.